Sunday, Sunday, Sunday inbound marketing nation! 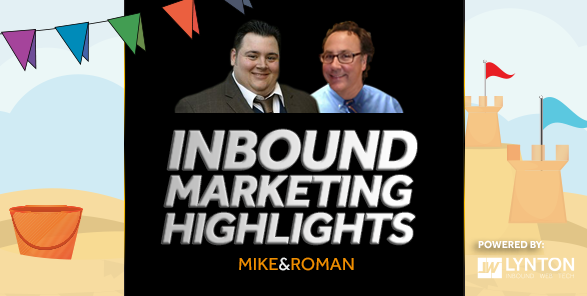 Welcome to Sunday's Inbound Marketing Highlights with Mike and Roman. How's that for a blog title? Big 4th of July plans? What Happens to Your Social Media Profiles When You Die? 63% of your shoppers are either switchers or brand agnostic. The more you can build love and loyalty for your brand, the better off you (and your sales) will be. “There are things brands can do to prevent switching and increase loyalty,” says Nguyen. “These include being available to your customers when it matters to them, not you; creating targeted and tailored ads showing they can access your products quickly and easily when they want to; and understanding what your competitors are doing. Dropping the pics is a nod to Google's mobile first push more than anything. If you're a thought leader, continue to write and publish content that sets you apart. A short reminder from the B2C space to keep it simple and tell folks what you really want them to do whether it's leave a review or download something. Don't beat around the bush. LeadIn is a WordPress plugin that provides site owners with marketing automation and lead tracking, which “gives you the details you need to make your next move,” according to the project’s website (the plugin is available for download). Death, taxes, and now social media profiles appear to be the only certainties in life. A useful infographic showing what happens to your social presence when you are of this earth no more. That's our inbound week - see you next time with more delicious inbound news! Have a sparkly 4th of July!